Brynford Eaton Higgins was born in Shepton Mallet, Somerset, in 1894. He was the son, and third of the four children, of insurance agent James Higgins (1836-1909) and Martha née Bond (b1834). In the 1911 census Brynford was recorded as a lodger in Bristol where he was working as a clerk for a cheese monger. He later moved to Yeovil where he worked for Aplin & Barrett. Brynford enlisted at Yeovil; the date is unknown although it is likely to have been during 1917. He joined a Mechanical Transport unit of the Army Service Corps. His Service Number was M2/201527. While in France he was attached to the 161st Siege Battery, Royal Garrison Artillery. While on home leave during December 1917, he married Phyllis Lawson of Bishopston, Bristol. Siege Batteries of the Royal Garrison Artillery were equipped with heavy howitzers, sending large calibre high explosive shells in high trajectory, plunging fire. A Siege Battery would include five officers and 177 other ranks, 17 riding horses, 6 draught horses and 80 heavy draught horses. The transport comprised three two-horse carts and ten four-horse wagons. The usual armaments were 6 inch, 8 inch and 9.2 inch howitzers, although some had huge railway- or road-mounted 12 inch howitzers. As British artillery tactics developed, the Siege Batteries were most often employed in destroying or neutralising the enemy artillery, as well as putting destructive fire down on strongpoints, dumps, store, roads and railways behind enemy lines. Because the siege batteries moved around during the course of the war, it is not known exactly where Brynford served with his battery. He was killed in action on 20 May 1918. He was 24 years old. 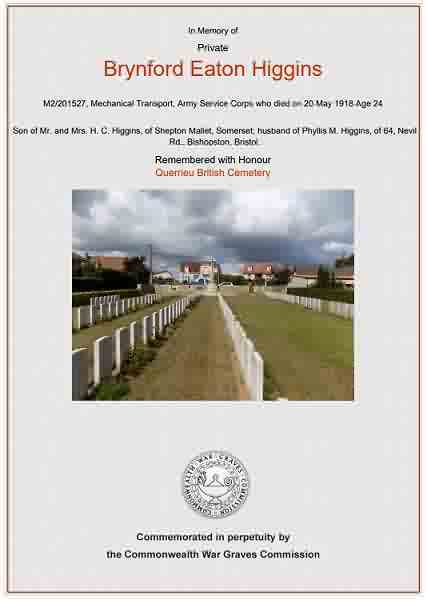 On 31 May 1918 the Western Gazette reported "Mr and Mrs Henry C Higgins, of “Ivydene,” Charlton Road, Shepton Mallet, have been informed of the death of their younger son, Private Brynford Eaton Higgins, who died in France of wounds received on Whit-Monday morning. The Germans heavily shelled the park in which the columns of the Motor Transport A/S.C., in which he was serving was stationed, and he received injuries from which he passed away in an unconscious state a few hours later. During the afternoon he, with two of his comrades, were laid to rest in a Military Cemetery, the funeral service being conducted by the Australian Church of England Brigade Chaplain. Private Higgins was a one time in the Bristol office of the well known firm of Messrs. William Cary & Son, with whom his father had been connected for over 40 years, and at the time he enlisted he was in a department of Messrs. Aplin & Barrett Ltd., Yeovil. Whilst home on his leave in December, he married Miss Phyllis Lawson, of Bishopston, Bristol, and the sad news of his death was conveyed to the bereaved young widow in letters received from his officer and the Chaplain. The deceased soldier was 24 years of age." Brynford was interred in Querrieu British Cemetery, Somme, France - Grave C16, and his name is recorded on the War Memorial in the Borough. 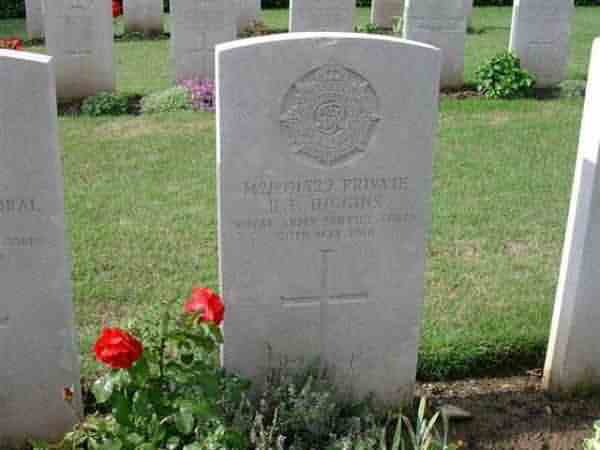 Brynford Higgins' Commonwealth War Graves Commission headstone. The Commonwealth War Graves Commission certificate in memory of Brynford Higgins.